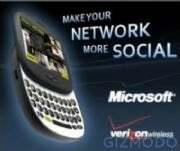 Tipsters have outed Microsoft's social network-loving phones, codenamed “Pink,” for an April launch on Verizon Wireless. Gizmodo claims it has bona fide marketing materials for at least one of the phones, a yet-unnamed vertical slider with a lumpy, round shape. Another phone, with a more traditional candy bar form, will launch around the same time, say the anonymous tipsters. There aren't any new details or specs on the phones themselves. The products in the marketing materials look just like the ones that appeared in leaked documents last September. Verizon's rumored tag line, “Make your network more social,” paired with the funky designs by Sidekick-maker Danger, suggest that Pink is for a younger crowd. Indeed, the more we know about these phones, the less exciting they become. Remember, there was a time when Pink was supposed to be an iPhone rival, at least that's what the Wall Street Journal reported in April 2009. That was before Verizon got the Motorola Droid, and before Google's Nexus One took the throne as the iPhone's most capable competitor. Microsoft's plans for Verizon are not what they initially seemed to be. With Pink, Verizon is not getting high-end smartphones. These phones clearly aren't in the same league as WinPho7, the best Android phones or the iPhone. Why the initial rumors about Pink had such lofty hopes is anybody's guess, but it's laughable to consider either of these simple sliders as iPhone killers now.